TimeTravelerTM allows you to compare document versions from different points-in-point. Open a Windows Explorer window and select the file or folder you are interested in. 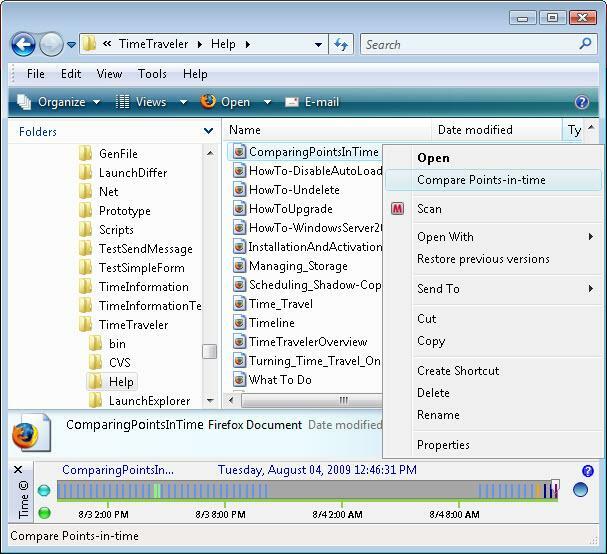 Upon selection TimeTravelerTM computes at which points-in-time the file or folder was changed. The dark time markers on the timeline are times at which the selection was changed. This guides you when selecting the times you want to use for the comparison. Use the mouse to drag the time cursor on the first point-in-time you want to use and then left-click on it. It will become orange to indicate that it is selected for comparison. Second, drag the time cursor on the second point-in-time you want to use for the comparison. Third, right-click on the Explorer selection in the list view and select "Compare Points-in-time". Figure 1 shows how to compare a prior point-in-time version with the current one. You can compare any two points-in-time. 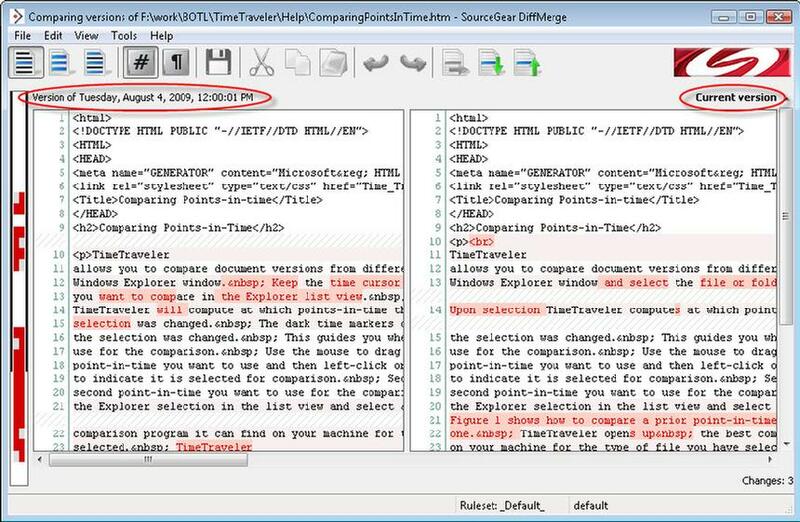 TimeTravelerTM opens up the best comparison program it can find on your machine for the type of file you have selected. On my machine, TimeTraveler opens up DiffMerge from SourceGear for HTML files. Look at Figure 2. The right-hand side contains the version from August 4, 2009, 12:00:01 PM and the left-hand side contains the current version. Support for more programs is coming soon. If you have a program you would like supported let us know by commenting on our Blog.